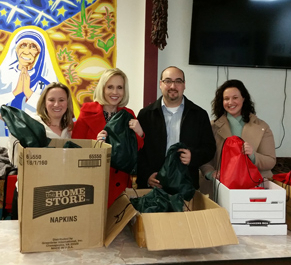 After spending the fall and winter months collecting much-needed items to be distributed to the area’s homeless during the holiday season, lawyers from the firms of Modrall Sperling and Sutin, Thayer & Browne gave out 400 Christmas stockings filled to the brim with toiletries, warm clothing and holiday treats. The annual Stock-a-Thon was started by the attorneys at Modrall Sperling and is now in its fourth year. It benefits the clients of St. Martin’s Hospitality Center, and provides much needed items such as soap, shampoo, toothbrushes, toothpaste, deodorant, socks, gloves, food items and hand warmers. Some 275 stockings were distributed at the shelter on Third Street during St. Martin’s Christmas Party; the remaining stockings were taken to the streets by the outreach team and distributed to homeless citizens outside the shelter. “At a time when these people do not have a home to go to at Christmas time or gifts to receive from loved ones, Modrall Sperling makes a difference! You are the family to these individuals. Your thoughtful gifts of warm and caring items help those who are so greatly in need,” says Amy Berman, Development Director for St. Martin’s.